What’s better than homemade soup? Soup made with homemade chicken stock that’s what! The whole house will smell like grandma’s house, all cozy and warm. 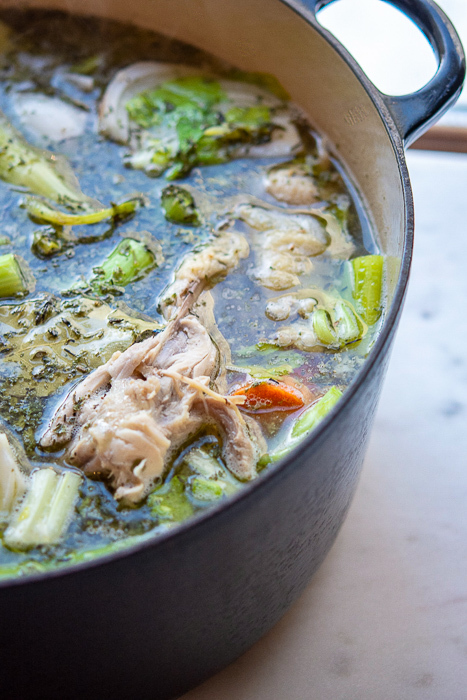 This is such a great way to use up some tired veg and create a truly spectacular stock. Simplicity at it’s finest but so rich and delish. Soup stock is not hard to make, putsy yes, hard no. Save scraps of veg and bones from a roast chicken (or roast turkey bones make a pretty amazing stock too!) and place in a heavy bag in the freezer for when you are ready to cook the stock. Heard of bone-broth? Well, this essentially is it. The bones are where all the flavor is, always. 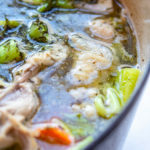 If you simmer the whole chicken, remove it from the bone and use it in salads (so good in Lemony Brown Rice Salad or Chicken & Black Bean Skillet) and sandwiches throughout the week. Or make chicken noodle soup! Don’t be alarmed if when you go to get your stock from the fridge and it’s very gelatinous, that means you’ve knocked it out of the park as far as making stock goes. The very best stock will turn that lovely wiggly jello-like consistancy when it’s slow cooked long enough. Don’t worry, it melts down into pure golden perfection when it hits a hot pan. Just pat yourself on the back to a job well done. One great thing about having a back porch in Minnesota is – instant freezer! It’s a great spot to cool down the stock before straining out the veg too. It’s best if you have a few kitchen items when making stock. Either 2 pots (one to cook, and one to strain into) or another large vessel to strain into. Cheesecloth works really well to get all the little pieces out, be sure to use all-cotton. If you don’t have cheesecloth, try a paper towel, but I can’t guarantee how effective that will be. You could use a coffee filter too, but bring your patience! 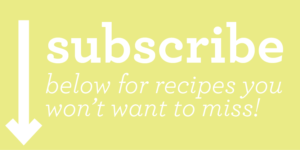 This works great in a slow-cooker as well. Put all the ingredients in the cooker, cover with water and cook for 8-12 hours on medium. Just keep it at a low simmer, not too high. Just set it, and forget it! If you absolutely can’t get to making homemade stock, then ‘doctor up’ a boxed stock by simmering some veg for an hour or so, then strain. Not quite the same, but it will help. What to make with this amazing soup stock? You will want to pick up some cheesecloth to strain out all the lovely bits and pieces once it’s cooled. You can usually find it at your local hardware store (I know Ace always has it) or you can order on Amazon. Be sure to get an all-cotton version, trim to fit your colander. Put ingredients in an 8 to 10-quart pot, cover with water by 1-inch. Bring to a boil and skim gray froth. Reduce heat and gently simmer, uncovered, skimming froth occasionally. After approximately 1 hour, remove the chicken and cool for a bit. Remove meat from bones (save for salads and sandwiches throughout the week) then put bones and skin back in the stock and continue to simmer for another 3-4 hours. Remove bones, strain through cheesecloth and colander into another large pot. Refrigerate, and when the stock is chilled, skim fat from the top. Another way to do this is to put it all in the fridge (or back porch during the cold of winter, when temps are at least beneath 38˚) then stain everything once chilled. Note: Stock can be chilled in fridge 3-5 days or frozen for 3 months.